Harare: Zimbabwean President Robert Mugabe clung to the vestiges of office on Sunday, using a TV address to maintain he was still in power despite a military takeover and a mounting clamour for his autocratic 37-year rule to end. 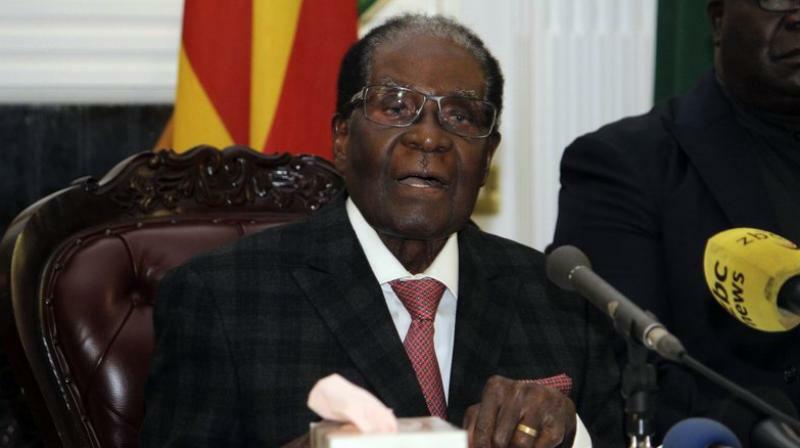 "The (ruling ZANU-PF) party congress is due in a few weeks and I will preside over its processes," Mugabe said, pitching the country into deep uncertainty. Many Zimbabweans had expected Mugabe, 93, to announce his resignation after the army seized power, opened the floodgates of citizen protest and his once-loyal party told him to quit. But Mugabe, sitting alongside the uniformed generals who were behind the military intervention, delivered a speech that conveyed he was unruffled by the turmoil. Speaking slowly and occasionally stumbling as he read from the pages, Mugabe talked of the need for solidarity to resolve national problems -- business-as-usual rhetoric that he has deployed over decades. He made no reference to the chorus for him to resign and shrugged off last week's dramatic military intervention. "The operation I have alluded to did not amount to a threat to our well-cherished constitutional order nor did it challenge my authority as head of state, not even as commander in chief," he said. Instead he urged harmony and comradeship. "Whatever the pros and cons of how they (the army) went about their operation, I... do acknowledge their concerns," said Mugabe. "We must learn to forgive and resolve contradictions, real or perceived, in a comradely Zimbabwean spirit." His address provoked immediate anger, and raised concerns that Zimbabwe could be at risk of a violent reaction to the political turmoil. "That speech has nothing to do with realities. We will go for impeachment and we are calling people back to the streets," Chris Mutsvangwa, head of the influential war veterans' association, said. It was not immediately clear from his remarks when and where the protests would take place. On Saturday, in scenes of public elation not seen since Zimbabwe's independence in 1980, huge crowds had marched and sang their way through Harare, believing Mugabe was about to step down. Highlighting the contradictions in Zimbabwean politics, the ruling ZANU-PF party sacked Mugabe as its leader earlier on Sunday and told him to resign as head of state, naming ousted vice president Emmerson Mnangagwa as the new party chief. Analysts say the military stepped in last week after Mugabe's wife Grace, 52, secured prime position to succeed him as president following a bitter power struggle with Mnangagwa, who has close ties to the army. The majority of Zimbabweans have only known life under Mugabe -- the world's oldest head of state -- during a reign defined by violent suppression, economic collapse and international isolation. Sources suggest Mugabe has been battling to delay his exit and to secure a deal guaranteeing future protection for him and his family. "What you saw yesterday, it shows that the people have spoken," Mordecai Makore, 71, a retired teacher said about Saturday's marches. "All we want is peace, a good life with a working economy that creates jobs for our people. We will continue praying for that. I want my children and grandchildren to live a normal good life." The factional succession race that triggered Zimbabwe's sudden crisis was between party hardliner Mnangagwa -- known as the Crocodile -- and a group called "Generation 40", or "G40", because its members are generally younger, which campaigned for Grace's cause. The president, who is feted in parts of Africa as the continent's last surviving independence leader, is in fragile health. But he previously said he would stand in elections next year that would see him remain in power until he was nearly 100 years old.